just between you and me: Lights, Camera, Action! This past week we spent a lot of time updating light fixtures. We began by replacing the gold lantern shaped chandelier for something a bit more contemporary (top right corner). At first I thought I would just spray paint what we had and hang it back up but it was going to require a lot of prep work and I knew I would eventually want to replace it anyway so we decided to replace it altogether. I've been wanting to update the lights in the kitchen as well but I knew I needed some large lights to light up the huge space and I wasn't enamored with any of the fixtures Home Depot or Lowes were selling especially for the price. I've been eying their prices for months waiting for a good deal but there just haven't been any. 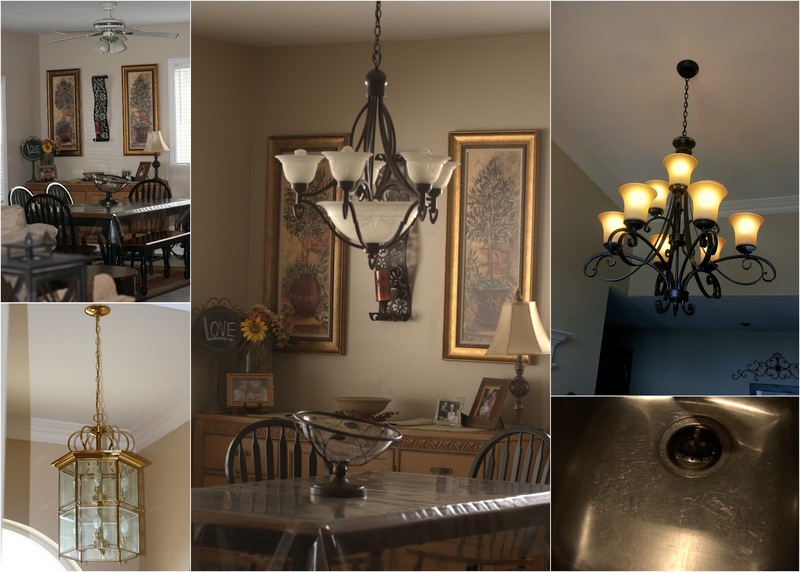 So out of curiosity I browsed the online classifieds and came across two beautiful fixtures for a steal of a deal. They were just the wrong finish. They were more of a copper color than the rubbed oil bronze I am going for. Last month I was introduced to a wonderful product named Rub n' Buff. The stuff is amazing and it goes a long way. It reminds me a bit of shoe polish. I put on a latex glove and an old sock, squirted a dot on the sock and rubbed it on the fixture. It dries almost immediately and is very forgiving. You can find it a Hobby Lobby for around two dollars if you use their 40% coupon. 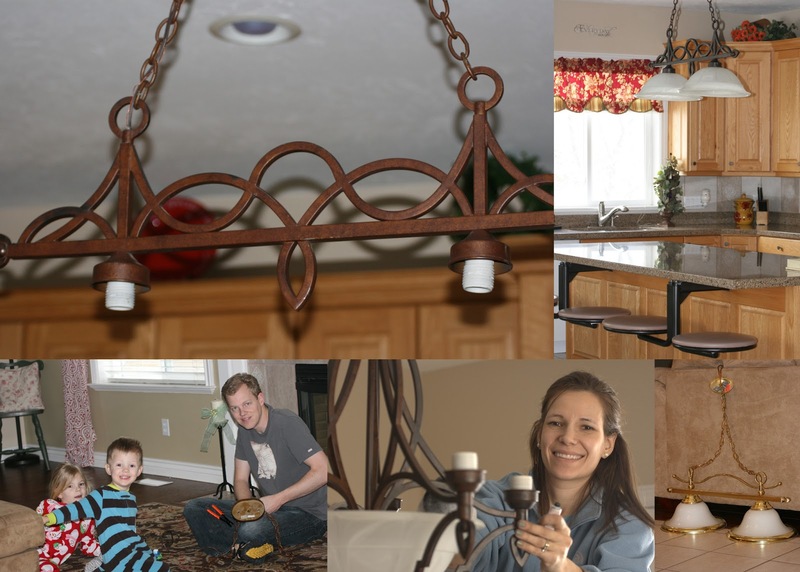 We also replaced several bowl shaped lights along hallways and in the laundry room. We've certainly made a lot of progress on that front. Our kitchen sink also received some attention. It was pretty scratched up from years of rough use. I found a great product on amazon that helped me sand a lot of the scratches out and polish it. It looks a lot better!